Wholesale case of 96 paperback Sri Isopanisad. We rebel at modern science's contention that we can be analyzed into lifeless laws and particles. We feel that personality is the solid foundation and unifying principle of our existence. That intuition is correct, says the Vedic philosophy of ancient India, which loudly proclaims the primacy of personality in every sphere of life and knowledge. "Because we do not know that there is a complete arrangement in nature for our maintenance, we make efforts to utilize the resources of nature to create a so-called complete life of sense enjoyment. Because the living entity cannot enjoy the life of the senses without being dovetailed with the complete whole, the misleading life of sense enjoyment is illusion. The hand of a body is a complete unit only as long as it is attached to the complete body. When the hand is severed from the body, it may appear like a hand, but it actually has none of the potencies of a hand. Similarly, living beings are part and parcel of the Complete Whole, and if they are severed from the Complete Whole, the illusory representation of completeness cannot fully satisfy them. The completeness of human life can be realized only when one engages in the service of the Complete Whole. All services in this world--whether social, political, communal, international or even interplanetary--will remain incomplete until they are dovetailed with the Complete Whole. When everything is dovetailed with the Complete Whole, the attached parts and parcels also become complete in themselves." From Sri Isopanasad Invocation. "The eighteen Sanskrit mantras of Sri Isopanisad are given in both devanagari and roman script, something that will be of great help to the beginning student. Swami Prabhupada has given intelligent and lucid commentaries on every mantra, and--unusual for this type of publication--a glossary and index has been added." 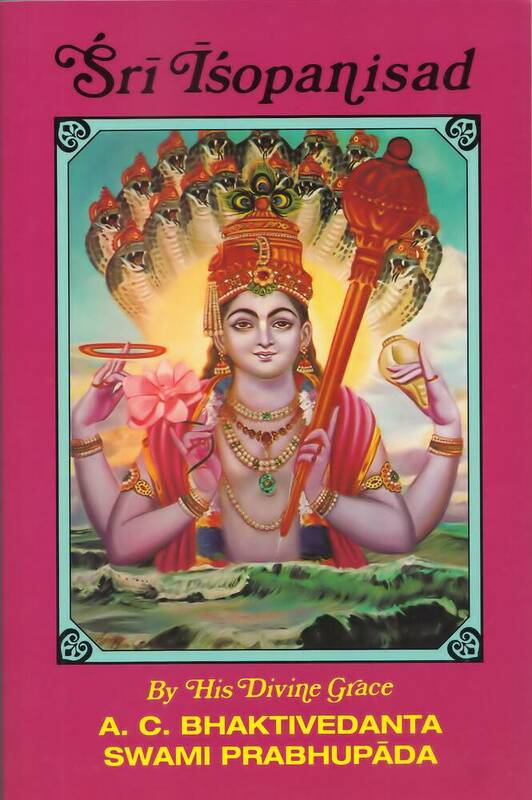 "The first available English edition of Sri Isopanisad makes this most significant publication accessable to a broader public of students and scholars. This spiritual lawbook, with a most useful introduction by His Divine Grace A.C. Bhaktivedanta Swami Prabhupada, is a necessary supplement to any serious study of the Vedic culture. The Sanskrit diacritical equivalents and the glossary are most useful guides to deeper study and further understanding of ancient spiritual law and Vedic culture. "I recommend this volume to any student or scholar of Vedic thought. To the generalist and specialist alike it will generate considerable provocation and understanding. It is an indispensable addition to any serious library collection."